Hailing from Venezuela by way of Motown, Jennifer Zea is one of the freshest vocal talents in Bossa and Latino soul. She’s earned respect in her field by travelling the globe and notching up over 100 live performances, alongside world renowned artists of the Jazz and World Music scenes. DJ Bobby Brazuka is the unofficial Brazilian ambassador of music and culture in Aotearoa ( New Zealand ), with a distinguished palate for Samba, Soul, funk and Latin hip hop amongst a host of other styles. Funkommunity trumpet player and talented solo producer Isaac Aesili, who descends from the small South American country of Guyana, provides a local grounding and familiar rhythm through his vast experience as an in-demand New Zealand musician. He’s toured with Trinity Roots, Shapeshifter and Recloose, contributing an authenticity to this outfit most others could only dream of. Together they create a unique and truly legitimate Latin act with a local flavour, both bending and blending the traditional music of their homelands with the modern sounds of here and now. Jennifer’s sultry singing layers Bobby’s beat selections beautifully, with Isaac providing the icing with live accompanying percussion. Spanish renditions of local hits by House of Shem and Ladi 6 sure to prove popular amongst the punters. 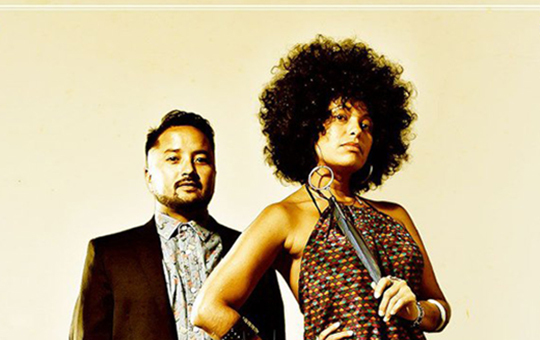 Likewise, Latin versions of classic soulful hip hop such as erykah Badu and the Pharcyde will strike a chord with kiwi listeners. With vast experience performing in front of local and international audiences, LatinAotearoa are ready to take the step to the next level in the approaching summer. However with the musical pedigree, multi-cultural exposure, impressive artist interaction and sheer talent that these artists possess, this trio is sure to shuffle feet and swing hips in whichever slice of our lucky little heaven they end up.